Written and filmed May, 1929. Released by MGM, June, 1929. Produced by Hal Roach. Directed by Lewis Foster. Two reels. Cast: Stan Laurel, Oliver Hardy, James Finlayson, Anne Cornwall, Gloria Greer, Charlie Hall, Harry Bernard. 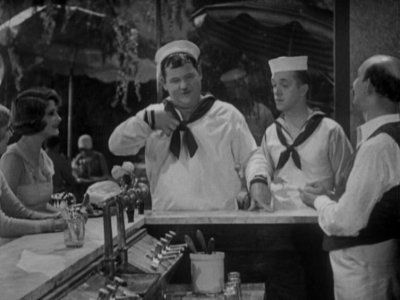 STORY: Sailors Laurel and Hardy flirt with two girls in the park. They treat the girls to sodas, though they haven't enough money to buy a round for the four of them. Fortunately, Stan wins a slot machine jackpot, enabling all to enjoy a rowboat ride. Predictably, they collide with other boaters, and a soggy free-for-all ensues. JB: In this, only their third talkie, Laurel and Hardy show they are well on their way to mastering sound comedy. The two major dialogue routines are within character, with the soda fountain scene being their first classic stretch of quotable dialogue. The Boys only have 15 cents, enough for three sodas but not four. So Ollie attempts to convince Stan not to order anything. Much of the fun comes from Ollie's verbal reactions to Stan's congenitally short attention span. "Can't you grasp the sitch-u-a-tion? ", he pleads with Stan, explaining that he's just putting on an act "for the goils!". After a quick punch and pinch fight with Stan, he turns to "the goils" and apologizes with "Just playing together." In print, these lines seem like nothing much, but Babe Hardy had already figured out how to get the most out of the simplest phrases. If you listen carefully to the scenes in the park, somebody is playing a ukelele in some shots, and not playing a ukelele in other shots! And the mechanical whirring of the cameras can be heard throughout the entire short. JL: Their strongest talkie to date, largely because of the soda-fountain scene that John describes. But the opening sequence with the girls in the park is also delightful, filled with the sort of casual ad-libbed dialogue ("Oh, he was the cutest thing!") that often characterized early talkies. Had the final sequence of Men O' War been up the standards of the preceding 15 minutes, the film might be regarded as a minor classic. 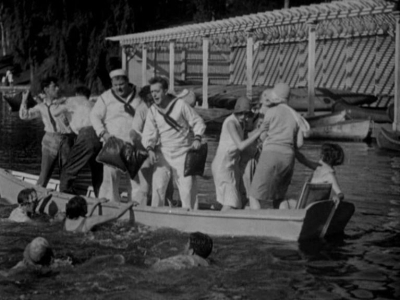 In a way, however, the rowboat melee was an important scene to make in that it was a lesson in the difficulty of adapting a silent-comedy routine to sound films. It's a scene that demands a tight pace, rapid editing, and a heavy emphasis on visual slapstick. But sound films no longer allowed for a bit of undercranking of the camera (which resulted in the unnaturally fast pace of silent slapstick), and the audible cries and gasps of the actors lessen the comic impact. The scene also suffers from rigid staging, and it was obviously filmed near a boat dock that allowed for the presence of camera and sound equipment. Because of this, we never really believe anybody is in any danger when they fall into three feet of water. But they were learning, and the first two-thirds of Men O' War shows how quickly they were mastering the art of sound film. Its strengths far outweigh its shortcomings.